The collection of features and technology integrated into the LX600 is unavailable from any other manufacturer and cannot be duplicated by just attaching a set of add-ons to another scope. Fast f/8 Advanced Coma-Free (ACF) optical systems. Meade has completely redesigned the OTAs with a new mirror mounting and focusing system to achieve zero image-shift and a two-speed microfocuser. The scope features faster f/8 ACF™ optics giving you pinpoint stars all the way across the field of view. The OTAs are available in 10, 12, 14 and 16 inch apertures. StarLock. 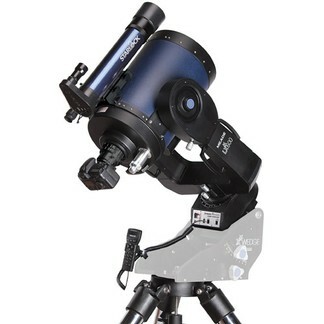 The LX600 integrates a unique star tracking and object finding system into the telescope mount. This integration allows the telescope to center your target perfectly in the field of view. Once centered, the star tracking system communicates directly with the motor drives to automatically assure your scope stays locked onto its target with arcsecond precision. The automated optical tracking system delivers long-exposure guiding with pinpoint stars on astro-images despite misalignments, atmospheric refraction, periodic or other mechanical errors. This level of precision is unobtainable with systems using high precision encoders, software pointing models, large gears or PEC training — and all without the need of an external computer. Internal Crayford-style 7:1 Focuser. The completely redesigned mirror mounting system achieves zero-image shift, eliminating the need for a mirror lock and integrates a two-speed microfocuser for quick and easy adjustments. Solid Fork Mount With Heavy Duty 5.75" Gears. Large, high-quality worm-gear drives in both axes provide smooth movements with low periodic error that are critical for long exposure astrophotography. Providing the freedom to go horizon to horizon without any meridian flip, unlike German Equatorial Mounts. Alt/Az Mode. In alt/az mode, the LX600 also makes for the best visual and short exposure experience possible. The LX600 performs LightSwitch® fully-automated self alignment. StarLock will put every target dead center in the eyepiece and track with arcsecond accuracy so you can concentrate on the beautiful, wide fields of pinpoint stars created by the superb f/8 ACF optical system. AutoStar II hand control with over 144,000 object database to take you to almost any object imaginable at the push of the GoTo button. AutoStar II allows the user to setup and operate the LX600 in just the way you want. Giant Field Tripod. With 3" diameter chromed steel legs and cast aluminum tripod head — adjustable from 34" to 54" — the Giant Field Tripod provides a research-grade foundation for the LX600 10, 12 and 14 inch models. Optional f/5 Focal Reducer/Field Flattener. The optional focal reducer, custom-designed for the 10, 12 and 14 inch OTAs, makes your scope a full-frame, flat-field f/5 optical system at a fraction of the cost of an OTA only from other manufacturers. All New X-Wedge™. Precision CNC-machined from ultra-ridged, aircraft-grade aluminum with smooth, accurate altitude and azimuth adjustments. Thirty percent more stable than competing equatorial wedges, the X-Wedge is the essential accessory for long exposure astroimaging.